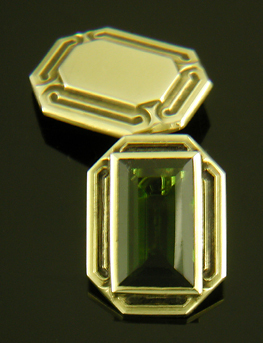 Recent additions to the Antique Cufflink Gallery include several Art Deco and Art Nouveau pairs set with diamonds. Deco Dazzle Dazzling Art Deco cufflinks with diamonds, intricately engraved centers and complementing white gold borders. A beautiful example of the jazzy brilliance of Art Deco design during the 1930s. Crafted in 14kt gold. Keller Diamonds Elegant Art Deco cufflinks set with sparkling diamonds and decoratively engraved with an "M" on one link and an "S" on the other. 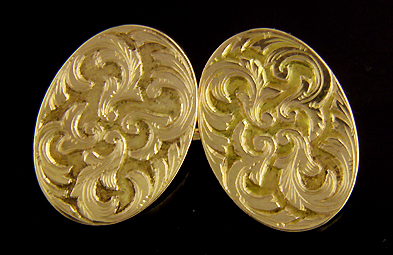 Created by Charles Keller & Co. in 14kt gold, circa 1925. Sinuous Vines The sinuous tendrils of a stylized vine or flower surround a sparkling star-set diamond. 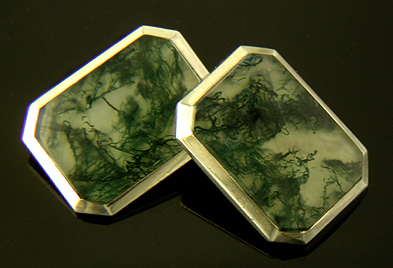 Part of a series of flora-inspired cufflinks created by an unidentified maker. Crafted in 14kt gold, circa 1900. In the Antique and Estate Jewelry Gallery I have just added a striking lion-serpent brooch by Carter, Howe and a lovely Krementz honeymoon brooch. Lion-Serpent and Pearl A Victorian chimera brooch with the head of a lion, feathered mane of an eagle and body of a serpent. Created by Carter, Howe in 14kt gold, circa 1890. Dogwood Honeymoon The Victorians loved jewels with hidden messages. This brooch with dogwood blossoms and a crescent moon had a special meaning. Created in 14kt gold, circa 1900.